When a couple get married it is customary for them to give thank you gifts to a number of people who have helped them on their journey to become husband and wife. It is often customary for the mothers of both the bride and groom to be presented with floral arrangements by means of thanks for their help and support in the run up to the wedding. These can be chosen either with the wedding theme in mind, or with the personal preference of the recipient being taken into account. As families today more often being extended, this tradition can also now include step-mothers, or a parent's new partner, anyone who has taken the place of a parent, or has assisted alongside them. A very emotional time for any parent, be prepared for tears as the Mums come to accept their flowers. The only downside with flowers as a thank you gift is that they are not a permanent reminder. Consider getting your photographer or a friend to capture the moment the happy couple present each Mum with their bouquet and arrange for the photograph to be framed and given to them at a later date. Typically the trickiest to buy for, especially if they are all of different ages and you wish your gift to be unique. Jewellery is a popular choice – choose a classic piece of jewellery such as silver, gold or diamond earrings, or a tasteful necklace – perhaps with a different pendant for each bridesmaid. Cost is always going to be an issue at such an expensive time and you want something that will really convey how much you appreciate their involvement in your wedding, without costing the earth. On the 'same but different' theme also consider 3 individual scrapbooks of memories that you have shared together - theatre or cinema tickets, old photographs and tales of funny times shared can be a beautiful, individual gift that won't break the bank. If you want a different completely different gift for each girl then you need to consider why you have chosen them to be your bridesmaid - something about your relationship with them may well give you the answer. Remember though that whatever you buy should be of the same value for each bridesmaid. Unfortunately things like this can be misread and a hint of favouritism may cause an atmosphere on your big day and should be avoided at all costs. The Maid of honour is the chief bridesmaid and is usually chosen because she is the best friend or sister of the bride. If unmarried, she will be Maid of Honour, if married, she will be Matron. 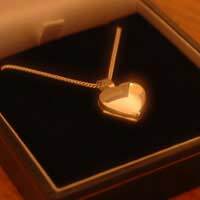 She is usually the bride's closest confidante and advisor and the bride will usually want to get her a very special gift that reflects the closeness of their relationship. Because of this, something personalised might be a good idea - a bracelet or pendant with an inscription from the couple - or a locket with a photograph of the bride and her maid of honour together. Jewellery is the most popular choice for the Maid or Matron of honour, and choosing something personal such as an initial pendant can make it that little bit more special. As with the bridesmaids, a 'memory' scrapbook with reminders of the times they have spent together is also a thoughtful and personal thought which can be given in addition to or as the main gift. The groom's ushers help the day go smoothly and play a vital role in attending to the wedding guests. The rules are the same for bridesmaids - whatever you choose to buy, make sure that the gifts are of equal value or you could end up with resentment between the ushers, leading to problems - especially when combined with the alcohol on offer at the reception! Gifts should be of good quality and can either be practical or fun. Consider good quality pens, customised cufflinks and inscribed wallets. The best man is usually the bridegroom's best friend or brother and is the keeper of the wedding rings. He is responsible for making sure that the Groom gets to the wedding on time and in good condition, not to mention having the unenviable task of writing and delivering a speech to the assembled guests. With such a lot to do it's only right that he should be well rewarded! What ever gift you should go for, each should be accompanied with a thank you note that has a personal message of thanks for the recipient. These are likely to be treasured as much as the gift itself, so thought and care should be put into it too.